A will and trust kit provides forms and instructions for a person who wants to make a will or create a living trust. 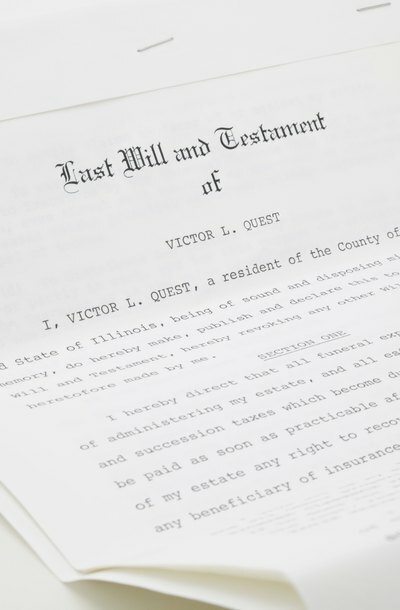 Wills and living trusts are common estate planning tools used to plan for the distribution of property after one's death. A will is a written document with directions for estate distribution, while a living trust is an agreement used to manage assets while a person is still living and after their death. If you're considering a will and trust kit, you'll need to evaluate the different types available and their associated benefits and drawbacks. Will and trust kits come in the following formats: online fill-in forms, mixture of both online fill-in and paper forms, or all paper forms. Some kits include software that provides all or some forms. Online-only kits take the user through a series of questions then prepares printable, final will and trust papers for the user to sign. Mixed kits have forms included in the kit — usually the most common forms, such as a simple will — and online access or software for those who need more specific or less standard forms. Paper kits usually have copies of basic will and trust papers, along with some special state-only or situation-specific forms. All kits come with instructions, but the level of detail varies by kit manufacturer. State-specific kits have forms tailored for one or a handful of states, while general kits have forms used in many areas. Trust and will forms vary by kit. Common forms include blank, type-in wills and blank, type-in trust agreements. Some kits include forms for an irrevocable living trust agreement, a trust the maker can't alter except under special circumstances, and forms for revocable living trust agreements, a trust that can be changed or terminated at any time. Kits may include more complex will fill-in forms. For example, you may want to create a testamentary trust in your will wherein you place estate assets into the trust by leaving the assets to the trust in your will. A kit with more complex forms may include a blank will with testamentary trust language already included. Using a will and trust kit allows you to create a will or trust privately and may save you time and money. Will and trust kits are less expensive than attorney fees in most areas. If you have a basic estate, making your own will or trust may be relatively simple and easy to do with clear directions and a will and trust kit from a reputable provider. Your will or trust must meet legal requirements for validity in your state. If you use a general will or trust form or misunderstand the kit's directions, you may end up with a will or trust that has the wrong terms or isn't valid under your state's laws. Estate planning often involves using specific strategies to take advantage of income tax benefits. You may end up costing your beneficiaries more if you're unaware of the tax implications of your estate plan. There are legitimate will and trust kits available from online legal document providers, but some products advertised as kits are actually scams. According to the Michigan State Bar's official website, companies that directly contact people to offer estate planning services, either in person or by mail, are suspect. Avoid a company that tries to sell you other products, such as insurance, or wants you to make specific investments as part of your estate planning. The State Bar of California: Do I Need a Living Trust? How Many Different Types of Wills Are There? A will is a document that explains how to distribute your property after your death. There are several different types of wills, although not all types are valid in all states. In most cases, a will must be in writing and signed by the testator, or person making the will, as well as at least two witnesses. Consult an attorney to find out what types of wills are valid in your state.